Onlinestrength analyzed 33 best-selling Milk Thistle supplements in the United States, measuring total levels of key active ingredients milk thistle (silybum marianum), and silymarin extract, as well as heavy metal contaminates and potentially harmful preservatives. Products that contained an effective dose of silymarin extract (70 – 80%) were ranked higher than the supplements containing a potentially ineffective dose. 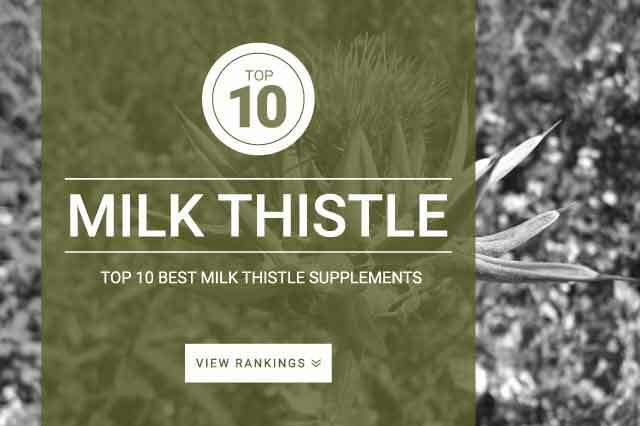 Several milk thistle supplements claimed to provide an extract that was “80% silymarin,” but our research reviled that these supplements containe much lower silymarin content per serving than what is labeled on the product. All supplements passed our ingredient quality assays. Milk thistle, a natural herb that contains powerful antioxidant and anti-inflammatory properties, that is commonly supplemented to aid in detoxifying the body, especially the liver. The majority of Milk thistle is cultivated and then turned into an extract in order to reap cell regenerating benefits. Milk thistle supplementation has been shown to promote healthy digestive function by boosting enzyme formation, increasing bile production in the gut, decreasing inflammation caused by poor diet or outside intoxicants such as alcohol, and soothing the mucous membranes throughout the body. Milk thistle works within the body to give the organs a health space to function optimally, improving the body’s natural detoxification processes. Liver healing and detoxification – Aids the body’s ability to cleanse and restore liver health by reversing the harmful effects caused by intoxicants such as alcohol, pesticides and heavy metals. Powerful Antioxidant – Helps fortify the immune system to give it the ability to fight DNA damage, and reverse cancerous tumor growth. Skin health – Reduces skin damage caused by sun radiation by reducing the oxidative stress caused by harmful UV rays. Anti-Aging – Powerful antioxidants help slow down the internal aging process by helping the body remove pollutants and waste from the blood and digestive tract. Anti-inflammatory – Keeps blood stream healthy and aids bloating, acne, joint pain, and troubled breathing. Supplementation of milk thistle extract after a long time of drinking can help counteract the harmful effects on your liver. Studies show that milk thistle will help your liver return to a healthy state faster once you stop drinking. Milk thistle dosage: 200 mg 2 to 3 times daily for total of 400 – 600 mg per day in divided doses of an extract standardized to contain 70% to 80% silymarin. Milk thistle supplementation is generally well-tolerated but, on rare occasion, can have a laxative effect that can cause some mild gastrointestinal issues.